Advanced Document Systems and Supply offers a large selection of new and used paper joggers for all your paper jogging needs. 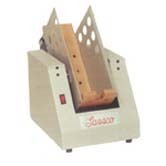 Paper Joggers are used to align the edges of stacked paper; producing a neat stack for ease of use in other machines. If your office builds alot of documents consistently, then owing a paper jogger will make paper handling tasks much easier and faster. Below you will find the Martin Yale Model 400 Jog-Fast Paper Jogger, Checkmate Paper Jogger, LJ-2 Paper Jogger, LJ-4 Paper Jogger, Handy Jog Paper Jogger, Intimus 4200 Heavy Duty Bench Paper Jogger, and the LJ-6 Paper Jogger. These high quality joggers will prepare paper for folding, copying, punching, binding, drilling, and printing. Our selection ranges from small compact joggers (ideal for office use) to heavy duty joggers capable of handling up to 750 sheets! 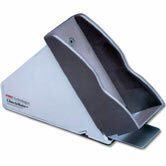 We also carry four bin joggers for quick and efficient sorting/collating of envelopes and checks. No matter what your paper jogging needs are, we can accommodate! Make sure to separate the sheets with a cushion of air. 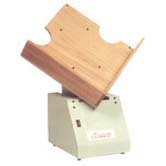 This will help to eliminate static charges (which hold paper together) and reduce friction to loosen up any sheets stuck together (a result of clamping, cutting, and wet ink). You can do this by fanning the paper a couple times. If you are jogging large amounts of paper, then it is best to jog in many small amounts. This will help obtain even sheet alignment. If you have any questions about our Paper Joggers, please call us at 1-800-808-2377. Small, compact jogger ideal for office use. It weighs 10 pounds and fits wherever needed. Operation is simple with a convenient start/stop bar located on the front of the unit. 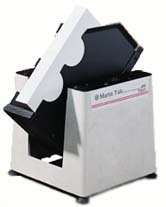 The Martin Yale 400 Paper Jogger Automatically jogs paper. 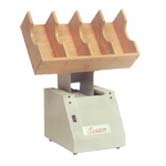 It reduces static electricity and paper sticking for easier processing for folding, copying, punching, binding, drilling, and printing. Perfect for quick printers and mail rooms. Ideal for checks and envelopes. of all forms of paper products. This economical paper jogger quickly and easily jogs paper up to 3" thick. 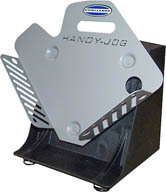 With its 11" x 13-1/2" tray, the handy jog can handle sizes up to 11" x 17" paper. 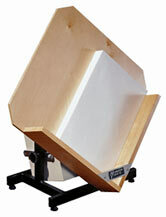 The Intimus 4200 Jogs up to 3\\\" (750 sheets) of 20 lb. paper. It helps eliminate static and paper sticking on sheet sizes up to 17\\\" x 22\\\"
of paper, envelopes, checks, and other materials.